The Los Angeles Kings are coming into the series after disposing of the Presidents' Trophy winning Vancouver Canucks in five games. While the St. Louis Blues handled the San Jose Sharks in just as many games. Both teams have been successful thanks to great play between the pipes. The Kings' Jonathan Quick grabbed a .953 save percentage through the first round, including a shutout in game three. On the other hand, the Blues have had stellar play from both Jaroslav Halak and Brian Elliott. Elliott has filled in for Halak after an injury early in game two. Elliott won the next four games and posted a .949 save percentage while doing so. 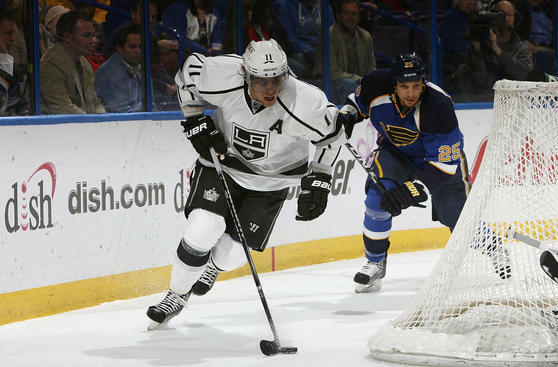 The Kings have been lead by captain, Dustin Brown, who recorded four goals, five points and unloaded 21 hits through the first round. The Blues have been lead by a veteran of their own, Andy McDonald. McDonald recorded four goals and eight points, including one game winner in their series against the Sharks. Halak is the only notable injury between the two teams. But, with Elliott playing the way he is, the injury is not as bad as it could be. Jeff Carter of the Kings came into the first round with a lingering ankle injury but did not miss a game against the Canucks. The Kings and Blues met four times during the regular season and the Kings won three of those games. Four of those games ended with a one goal difference, and three were won in shutout fashion (two for Los Angeles, one for St. Louis), these games should mirror how this series will play out. The goalies for both teams have been outstanding and if they continue to play like they have, expect low scoring games, and a few overtimes through out this series. The winner of this series will be decided on special teams. The Blues were extremely successful on the power play in the opening round, scoring six times on 18 chances for a 33.3 success rate. The Kings have a much better penalty kill than the Sharks and should give the Blues more trouble. However, the Kings will need to do better than the 11.5 success rate they had in the first round to win this series. 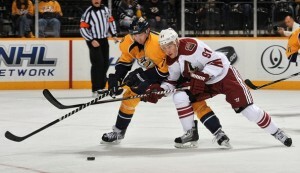 The Phoenix Coyotes and Nashville Predators are both coming off first round wins over Original Six teams. The Coyotes disposed of the Chicago Blackhawks in six games, and the Predators ousted the Detroit Red Wings in five games. The Coyotes went to overtime in five of their six games against the Blackhawks, several of which were forced by the Coyotes giving up goals late in the third. Some shaky goals by the Blackhawks' Corey Crawford may have helped propel the Coyotes into the second round, but the major factor was the Coyotes' Mike Smith. Smith has a .950 save percentage through six games, and turned out a 39 save shutout in game six to eliminate Chicago. Nashville was the first team to punch their ticket to the second round when they eliminated the Red Wings, and how great it must have felt to finally take it to the big brother of the Central Division. The Predators' Pekka Rinne played just as phenomenal as Smith, Rinne grabbed a .944 save percentage. Have you figured out the trend in the West yet? The Predators' Hall Gill may have benefited from the long break the Preds got when they eliminated the Wings. Gill is expected to be back in the line-up for game one, bringing both rosters to their full potential. I may sound like a broken record here but, goaltending is yet again a deciding factor in this series. Since both goalies have carried their teams into the second round it will likely be a similar story through round two. The goalie that makes the least mistakes, which will probably be slim to none, will win this series. The Predators' Alexander Radulov had five points through five games but only one goal. If Radulov finds his groove the Coyotes may be in trouble, more trouble than they already are in. The Coyotes' offense wont have any room to move with the tight checking defense of the Predators. Shea Weber and Ryan Suter handled the offensive stars of the Red Wings and should make easy work of the Coyotes. I don't see the Coyotes scoring too much in this series, which means Smith will likely have to keep these to one goal games if the Coyotes want a shot at winning this series.